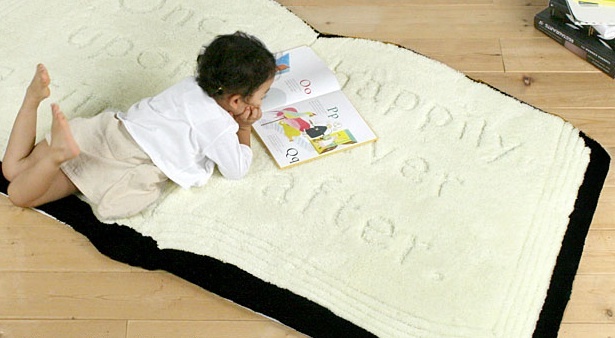 I'm in love with this "Pop Up Book rug designed by the Bob Foundation and sold on a Japanese website for 28,000 yen or about $296 (tax included.)" Found via My Modern Met. I love it and would love one in my office. How awesome that would be! Not sure where it came from before Bob Foundation sold it. Oh well, at least I own this silver pendant which at least has the same sentiment. It's price was much more reasonable in comparison. (And yes, the engraving was extra, so it did cost more!) But I love it. And it's much easier to store. 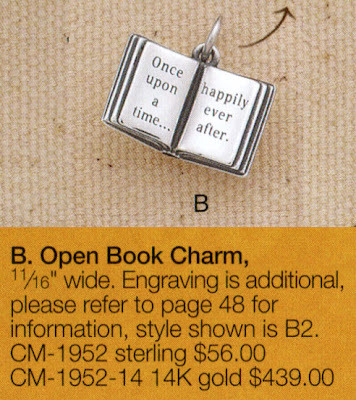 It's from James Avery and I have posted about it before. It was my celebratory reward when I sold my first 100 books. Amazon has a new The Big Deal with many great bargain books. The sale is through March 10th, but experience has taught me that some books disappear from the list once they meet some quota or other measure. So don't delay on books you really want! My top pick so far--I'm still sorting through the categories--has been The Hero's Guide to Saving Your Kingdom (The League of Princes) by Christopher Healy. I have needed to acquire my own copy since my paper copy went home at Christmas with an adoring niece who couldn't leave it behind. Despite her claim a few days earlier that she never rereads books anymore and that she had finished it. I was just privately amused and didn't point this out to her as I waved the book goodbye and returned the title to my personal acquisition list. She's ten, she's allowed to be contradictory just like the rest of us. Anyway, I just got to replace it for $1.99. Thank you! And The Summer of Moonlight Secrets by Danette Haworth has such a beautiful cover--I want to be wherever that is. And I suspect the big reveal involves mermaids or selkies. Because they usually do. Although I could be wrong! The description promises myth and mystery, a delicious combination, yes? There are some other favorites that aren't fairy tale connected, especially for me in the Big Deal: Children's Titles , like Betsy-Tacy (Betsy-Tacy Books) and even some fairy tale picture books--I like to have some as backup although I am still adamantly a paper book person when it comes to picture books. Hello folks, I will get back to regular posting soon--the blog is not dying, I'm just BUSY--but here's a TODAY only bargain ebook, a recent release. Unlocking the Spell: A Tale of the Wide-Awake Princess (Tales of the Wide-Awake Princess) by E. D. Baker is $1.99 today only. And it was only released this past October. I heard Baker talk about it at the Southern Festival of Books a few weeks later and my admiration for her only grew. And you want this one, because it's inspired by Snow White and Rose Red. How often does that happen? Not very. And the reviews for it are great. It's a companion book to The Wide-Awake Princess which also happens to be $1.99. Bears, princes, witches, dwarves, and other fanciful fairy tale creatures step out in this charming story about Annie and her sister Gwendolyn ... and Gwendolyn’s beloved prince, Beldegard the Bear. You see, Beldegard is only human when he’s near Annie, so Gwendolyn is desperate to find the evil dwarf who turned Beldegard into a bear in the first place, and reverse the terrible spell. But Annie has just traipsed all over the kingdom to free her sister from the Sleeping Beauty spell...will she want to set out on a magical quest once more? Or has she had enough of watching her sister gaze lovingly into Beldegard’s eyes? With trademark humor and many delightful twists, E. D. Baker brings us back to a magical land that offers many layers of fun and fantasy. And while we're here, talking about princesses and queens and all, She-Wolves: The Women Who Ruled England Before Elizabeth by Helen Castor is also $1.99 for a short time. Ha, when you see the recommendation blurb by Hilary Mantel who's managed to get herself from press this past week. In the tradition of Antonia Fraser, David Starkey, and Alison Weir, prize-winning historian Helen Castor delivers a compelling, eye-opening examination of women and power in England, witnessed through the lives of six women who exercised power against all odds—and one who never got the chance. Exploring the narratives of the Empress Matilda, Eleanor of Aquitaine, Isabella of France, Margaret of Anjou, and other “she-wolves,” as well as that of the Nine Days' Queen, Lady Jane Grey, Castor invokes a magisterial discussion of how much—and how little—has changed through the centuries. Conference Announcement! Haven't had one of these in a while.... Oh, there are times when I wish I were in the Northeast and not the South! Professor Maria Tatar, professor of Germanic Languages at Harvard and a leading international scholar on myth, folklore, and fairy tales will be presenting. She is speaking with Dr. Nancy Kulish, a psychoanalyst who has challenged the usefulness of the Oedipus myth to describe girls' development. From different (and similar) disciplinary perspectives, both scholars will deconstruct feminist and gendered elements of myth and fairy tales with a particular eye on passion and the prohibitions against it. We are going where only children dare to tread. prohibition in fairy tales and in psychoanalysis. To register for the symposium or to learn more about it, please go to http://www.westernnewengland.org/symposium/. Last week, Kristen at Tales of Faerie posted about Twelve Dancing Princesses Tales From Around the World with two posts, The Underground Kingdom: Part I and The Underground Kingdom: Part II. In those entries, she proceeds to summarize and explain some of the unique elements of the Twelve Dancing Princesses type tales in the book. I enjoyed rereading these because I love the tale, loved researching and editing the book, and yet I have forgotten the nuances of many of the tales in the three years since I completed the book. Cinderella, Bluebeard, Mermaids, and Beauty and the Beast have overrun that portion of my brain's storage since that time. And yet, sometime this year, I plan to finally finish the Grateful Dead collection that was spawned from this book. I have an almost complete manuscript for it--I started it while working on this book, but I know the demand is small for such a lesser known tale, so the final edit remains undone. It has over 40 tales and several plays--that tale used to be rewritten and repeatedly reproduced on stage at least once a century. Either way, it will make a fun All Souls' Day/Samhain/Halloween release for 2013, yes? But this post is about The Twelve Dancing Princesses. Kristin did such a great job that it makes me want to go back and reread my own book! I completed the book around the same time as the small surge in Twelve Dancing Princesses inspired novels were being published. This is the only collection I've worked on where an entire novel pretty much sprang into my head, too. Alas, it remains unwritten since I can only work two jobs a day. And Twelve Dancing Princesses Tales From Around the World was never promoted as well by me since the week of its release I was violently ill and my brain went out of commission for months afterwards as a result of weeks of bouts with a high fever. The Princesses are sometimes willing and sometimes under a spell; the land they travel to is usually an evil and dangerous place in most Western versions but even then there are exceptions. Either way the reader is generally excited to hear about the forbidden journey and the supernatural secrets that are revealed. In her introduction to the book, Heidi Anne Heiner speculates that since the Princesses generally don't want to be rescued, that may be part of the appeal of the tale. What do you think, readers? Do you have a particular favorite variant? Why do you like or not like this tale? The morality in this tale still remains more ambiguous than many other tale types. Perhaps that is one reason why it fascinates so many writers and readers. Thanks, Kristin, for sharing the book so well. It really is a fascinating tale! 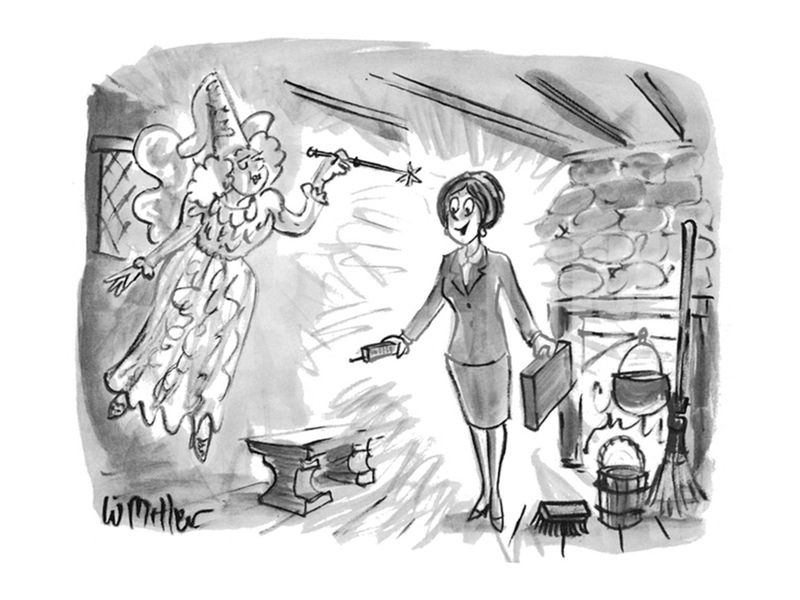 Art.com has a new series of New Yorker cartoons with fairy tale inspirations available for order. I thought I would share a few over the next few days. This one is by Warren Miller. Published December 13, 1993. 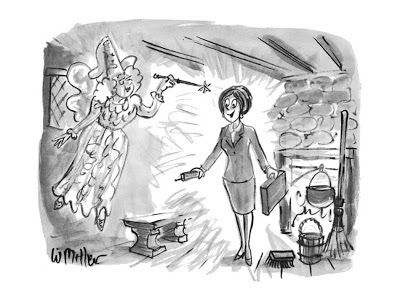 Fairy Godmother turns Cinderella into fashionable, business-suited woman with cellular phone and briefcase. I think some of these also appear in Mother Goose on the Loose , which is out of print, but I haven't had the inclination to check. They are available individually from Art.com. My Epic Fairy Tale Fail (My Very UnFairy Tale Life) by Anna Staniszewski will be released on March 1, so interviews and such are popping up around the the internet. 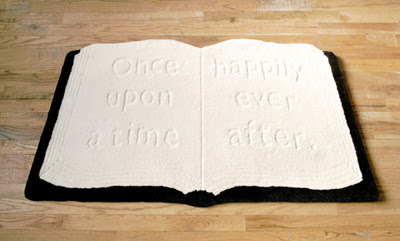 And, yes, this is the sequel to My Very UnFairy Tale Life . Jenny has finally accepted her life of magic and mayhem as savior of fairy tale kingdoms, but that doesn't mean the job's any easier. Her new mission is to travel to the Land of Tales to defeat an evil witch and complete three Impossible Tasks. Throw in some school friends, a bumbling knight, a rhyming troll, and a giant bird, and happily ever after starts looking far far away. But with her parents' fate on the line, this is one happy ending Jenny is determined to deliver. In an age of teen angst and dark tales, your characters are light and fresh and funny. How did you come up with hilarious characters such as Anthony the Gnome and Sir Knight? From the start, the UnFairy Tale series was meant to be playful and funny. In My Epic Fairy Tale Fail, Jenny visits the Land of Tales which is the place where all fairy tales originated. I really wanted to play with the expectations we have of fairy tales. For example, a fairy tale land must have a brave knight: thus, the overly-heroic Sir Knight was born. I exaggerated his need to rescue damsels in distress until it became completely ridiculous (picture him saving fair maidens from swooping pigeons). I had a lot of fun weaving in fairy tale elements and then twisting them until they were wacky and over-the-top. I'm all for wacky and over-the-top and this book delivers! I am also a huge fan of fairy tales and mythology and the Land of Tales is where, in your world, it all began. 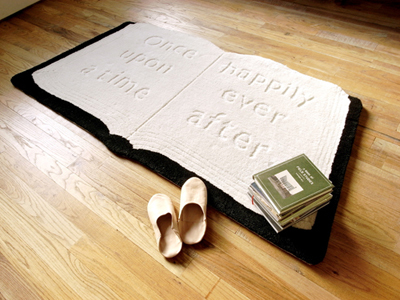 It's true that many cultures share remarkably similar stories, which fairy tale is your cross-cultural favorite? A fairy tale that I only discovered as an adult was "East of the Sun, West of the Moon." It's a beautiful tale that's reminiscent of Beauty and the Beast, but in it, the heroine must go on a quest to rescue the prince (instead of the other way around). I think this tale was in my brain when I began working on the first book in the My Very UnFairy Tale series. I really wanted the main character, Jenny, to be the kind of girl who wouldn't hesitate to go rescue the prince. Anyone surprised that her favorite fairy tale is East of the Sun, West of the Moon? Of course not! It's a very popular favorite around here. "Horse-Skin" from Tales of Old Lusitania: From the Folk-Lore of Portugal by F. Adolpho Coelho and translated by Henriqueta Monteiro, offers us a Cinderella with a vague cannibalistic story. The wonder of stories across cultures? That while the sisters in the Greek tale are the cannibalistic villains, these are the self-sacrificing victims along with Cinderella. Bonus: We get a full explanation of how Cinderella's persecution comes about, father's actions included. Although some variants offer some explanation for the father's absence (if he is alive), this one makes him fully culpable. THIS is the story of a wicked king, who was a widower and had three daughters. On his return to the palace he said to his daughters, “Get ready at once to go with me to the Tower of Moncorvo, where I will show you what you have never seen before in your life.” The daughters, full of confidence in their father, and not suspecting any treachery, readily prepared to accompany him, and after travelling many leagues arrived at the celebrated tower. When the king had them safe in the castle, he said to his daughters, “Remain here, whilst I pay a short visit to a friend and worthy subject, who lives in this neighbourhood. On my return I will take you back to the palace.” The wicked king, who only made up this excuse to blind his daughters to his real intentions, fastened the great gates of the Tower as he went out, so that his daughters could not possibly escape. He supplied them with food every day until his marriage day, but after that he never concerned himself about them any more, but left them to their fate. Hours passed, and days came and went, and still no succour arrived, and they began to be in a dreadful state, without a morsel of food or water to refresh them. And so it happened that one day, when they had given up all hopes of being relieved, and were nearly dead from starvation, the eldest of the princesses said to her sisters, “Why should we all starve? The best thing you two can do is to kill me and feed upon me as long as I afford you sustenance.” She had hardly said these words when she dropped down dead from want. A few days after this sad event the surviving princesses were again short of food, and nothing was left them but to die. Then the second sister, remembering what the first one had so generously done, followed her example, and suggested that her younger sister should kill her for food: and when she had finished uttering the last words of her advice she also dropped down and died. The poor young girl, now left alone in the large dreary castle, felt very disconsolate, and rent the air with her lamentations. But after a while, being of a courageous mind, she thought to herself that weeping was no remedy for her woes, and that she must devise some means of escape from her prison before she became faint again with want. The story goes on to be a more traditional Cinderella tale at this point, predominantly an ATU 510B although the beginning is a blend of 510A and B with the wicked stepmother and an interesting twist on the exile. And the big question for the reader to decide? Did she or didn't she partake? The text implies yes more than no but to preserve the moral judgment of the reader, it is left to you to decide. And while we're here, I must wave at Valerie and Brian for helping me procure this book so I didn't have to translate the tale myself! I wanted to include it rather desperately and they made it happen. This version was part of a long line of variations that eventually spread throughout Europe, finding their way into the Brothers Grimm fairytales as Frau Holle, and even into Shakespeare's The Merchant of Venice. Oh me oh my! And here I keep debating between Diamonds and Toads and the Six Swans and sometimes Swan Maidens for the next SurLaLune collection. It seems the universe keeps voting for Diamonds and Toads which is how I usually reference Kind and Unkind Girls in conversation (but not in my head interestingly enough) since that is a mouthful. And Diamonds and Toads sticks in people's brains better, too. Something about the image of vomiting snakes and such is compelling! I can't wait to read the study and am fascinated by the tale because there is such an abundance of versions--I've lost count on how many I have collected myself. I have at least half a book already without any effort. Dewitched: The Untold Story of the Evil Queen by E. L. Sarnoff has been dropped to $.99 through today only. The sequel, UNHITCHED: The Untold Story of the Evil Queen 2 (DEWITCHED) , is $2.99.